A while back I wrote a piece clarifying some myths about increased coal consumption in the EU. I did that because the clear trend in the EU is just like the U.S. -- a move beyond coal. Now it looks as though a similar set of myths is developing around coal growth in Japan. The problem is, just like the EU, the myth doesn't match reality. Here's what's really going on. The 2011 earthquake and super tsunami have taken a big chunk of Japanese electrical production offline. Today only two of the country's 50 nuclear reactors have come back online and the national debate still rages over the future of nuclear power. In this vacuum a few analysts have suggested coal is filling the gap. It turns out this in fact is not happening, but it's getting attention because reporters love a good counter-factual argument. 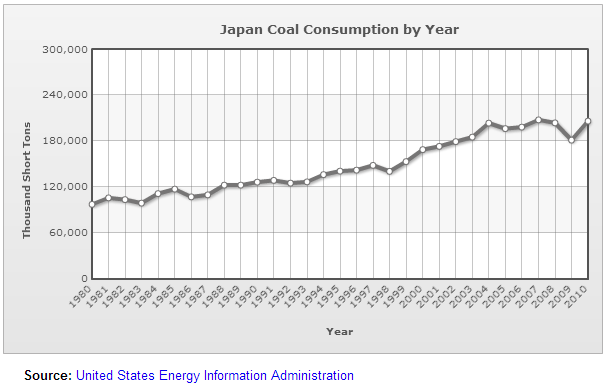 As it turns out Japan's total coal consumption hit a peak in 2007 and hasn't moved upwards much since then. 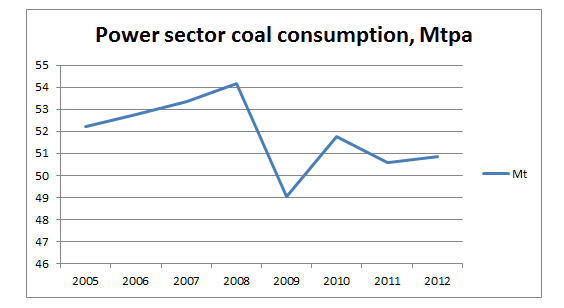 In fact, in 2011, total coal consumption dipped roughly 6 percent. This changed slightly in 2012 when coal consumption did go up -- a whopping 0.2 percent in the power sector and 4 percent for industrial uses -- hardly a resurgence. But why didn't it go up if they needed the power? A big part of the reason coal didn't replace nuclear immediately after the tsunami is that coal plants were also forced to idle production given the impacts of the storm. At the same time, the plants that were still functioning didn't have a lot of spare capacity so there wasn't much room to increase production. Since you can't build a coal plant overnight -- they typically take around five years -- there wasn't much the country could do. Well maybe they couldn't ramp up fast, but they must be planning a wave of new coal plants now, right? Nope. According to the World Resources Institute, Japan only has plans to build four new plants totaling 3.2 gigawatts. 50 percent of this capacity is scheduled for commissioning soon, but the other half (1.6 gigawatts (GW)) is not even supposed to be commissioned until the next decade. One 600 MW unit is not slated to even start construction until 2015 meaning, at best, it won't be online until 2020. Another 1,000 MW project, which has been on the drawing boards for years, has a commissioning date of 2023 "or later." But even if all of it were to come online next year it is only about 1 percent of total electricity capacity in Japan. So much for the hype. It's also important to note that while most of the coal-fired fleet of power stations in Japan is relatively modern (1990s or later) there are a number of older generating units (including a couple of coal/oil units from the 1970s) and a handful from around 1980. That means that while there are two new coal plants being commissioned soon, and maybe one more by 2020, there are a number of older plants which are getting towards the end of their life that will need to be retired. A booming coal sector this scenario does not make. Of course as long as we're discussing facts, it's also important to point out that Bloomberg forecasts that Japan will become the world's second largest solar market this year. Solar isn't the only growth market though. Bloomberg reported that another 21 geothermal plants are under consideration and that wind is also likely to boom. The combination of wind and solar could be particularly problematic for the future of coal (and nuclear) because it is as inflexible a source of power as you'll find -- it just doesn't mix well with variable output. Japan could be facing a situation where coal and others with fuel costs would be forced to ramp down their output to accommodate the variable solar and wind output. That means if they do get the nukes restarted, a few coal plants get built and solar keeps growing, there could be a clash. That means the economic future for coal is anything but certain. The truth is that as the data above shows Fukushima marked the end, not the beginning of a clear trend in rising coal consumption. So where's all the coal hype coming from? Hard to say, but with the winds of change against the coal industry it's clear they are trying to take advantage of this tragedy -- facts be damned. This post was co-authored by Lauri Myllyvirta of Greenpeace International, and Ted Nace and Bob Burton of CoalSwarm.